>> BUY PIPELINE SIGNS HERE! The following are guidelines describing when pipeline warning signs are required and where/how they must be positioned. If a pipeline crosses a highway, road or watercourse, a pipeline warning sign is required. In this case, a warning sign must be on both sides of the crossing. If the pipeline’s right of way connects to the right of way of a highway, road or railway, a pipeline warning sign is required only if the pipeline is on the common boundary of the rights of way but not within the right of way of the highway, road or railway. If a pipeline is located in a ditch or unpaved area in the right of way of a highway or road, a warning side is required at intervals that will clearly and continuously mark the location of the pipeline. If a pipeline is conveying HVP (high vapour pressure) product in an urban area, a warning sign is required at intervals that will clearly and continuously mark the location of the pipeline. 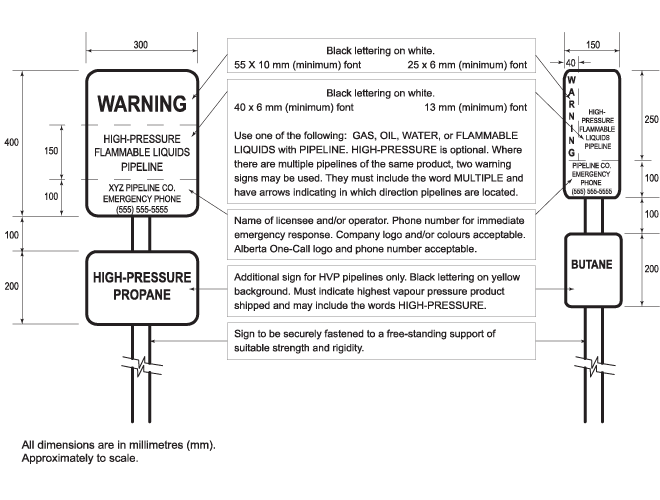 The installation of pipeline warning signs must adhere to the strict guidelines listed below. All warning signs must be installed before the pipeline is in operation. The warning signs must be installed in accordance with the guidelines provided in Schedule 1. The format must be consistent for the entire pipeline. If a fence exists, the warning signs can not be installed more than 300 millimetres from the fence line. Warning signs should be installed as close to the centerline of the pipeline as possible (without the risk of striking the pipeline). All warning signs should be installed in an area that is not obscured by brush or other objects. Warning signs must be independent and free-standing. They cannot be attached to any other structures except fencing surrounding the licensee’s facilities. A licensee can install temporary warning signs that are not in accordance with Schedule 1 while surface restoration activities are in progress. However, as soon as the surface restoration activities are completed, the licensee must install permanent warning signs in accordance with Schedule 1. Once pipeline warning signs have been installed, licensees are required to comply with the strict guidelines listed below. It is the licensee’s responsibility to maintain pipeline warning signs regardless of the operational status of the pipelines (even if the pipeline is abandoned). In doing so, the licensee is required to replace any pipeline warning sign that become defaced, worn out or illegible or that is missing or destroyed. It is the licensee’s responsibility to update all warning signs, regardless of operational status, by replacing them with new signs or applying durable permanent adhesive decals with the updated information. This must be done before a phone number on the warning sign becomes invalid and/or within 180 days of a change to any other piece of information required in Schedule 1 (unless otherwise noted by the Board). If a pipeline or part of a pipeline has been removed, any existing warning signs in that area must be removed. 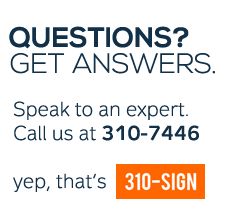 If a pipeline has been abandoned, a licensee cannot indicate this on the pipeline sign. The licensee is the same for each pipeline in the group. Each pipeline in the group carries the same product. The warning sign, in accordance with Schedule 1, identifies that there are other pipelines close by. None of the pipelines in the group convey HVP product or gas containing more than 10 moles of hydrogen sulphide gas per kilomole of natural gas. The warning signs for a group of pipelines must be placed on both sides of the right of way containing the group and can not be more than 60 metres apart. In accordance with Schedule 2, a licensee must install pipeline warning signs adjacent to all pipeline installations. This includes meter regulator stations, regulator stations, valves, field manifolds and line heaters. A licensee must install a large facility identification sign at the entrance to any gas compressor station and oil pumping station. This sign must state the name of the facility, the legal location of the facility, the name of the licensee, an emergency telephone number and a warning symbol as set out in Schedule 2. 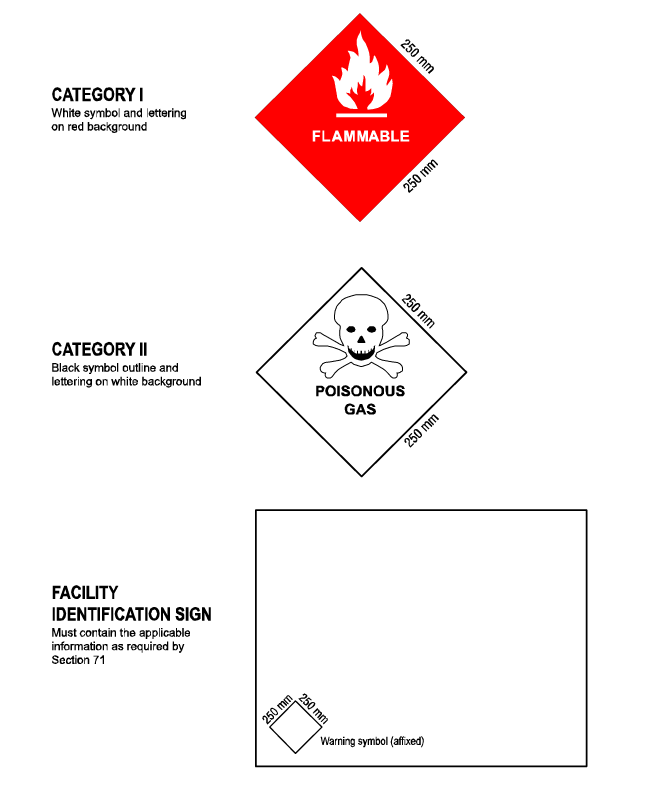 A Category I symbol must be used unless an installation conveys a poisonous substance, in which case a Category II symbol must be used. No warning symbols may be used that do not conform to the requirements set out in this section and Schedule 2.